So, its taken me a few days to get my bearings straight... I can't believe it is 2010. OMG. I'm sure we've heard it over and over again, but fo' serious... TIME FLIES! Ok, so to keep me accountable... I've got to tell y'all what my NY resolutions are, right? Those are my main two long term resolutions. Another gray cloud which has been hovering over my attitude of late is my wedding and the fact that my father will not be there. I've not mentioned it... while I have created drafts of post but never published them... b/c I guess once i click "publish" it makes the issues that much more real... But i do want to talk them through and am hoping that I can do so before the wedding... and this is yet a short term resolution I have... to talk this out... talk it through. Come to terms with and find closure on this issue. Life is good. It can always be better. It can always be worse... but my satisfaction comes in knowing that I'm in control of my own fate... right? RIGHT! Ok... So Happy New Year Y'all... 2010 is gonna be great! It will definitely be a great one! We are all here from you when you're ready! 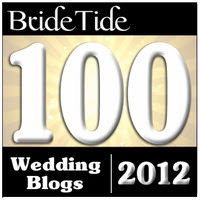 Happy New Year and congratulations on being on the Top 100 wedding blogger list! Happy New Year to you too AmyJean! Hoping that it will be a wonderful year for you! Happy New Year! 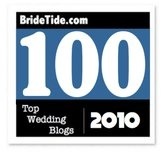 And best of luck with the final wedding planning before the big day!! Happy New Year! My mother isn't coming to my wedding either, so I hear you on the gray cloud. Your day will be magnificent regardless! So sorry to hear about your father and the unfortunate issues you've been dealing with. Weddings always seem to bring things up that may not be pleasant to deal with. But know that you have lots of support and with a good perspective (focus on the happy moments of the day and the marriage) you will get through and hopefully not let these things distract you or bring you down on one of the most exciting moments of your life. :) Hang in there!